Well here it is. The wall came together so nicely, with things collected from here and there. The focal point is my garage sale find, flanked by a colored pencil drawing of a mermaid (top left) that was a graduation gift from a dear teacher in high school. There's a little butterfly lady painting from a market in China, 4 small oddities from Goodwill, a gold leaf canvas that I did a while ago and finally, a brand new silhouette of Elliot. His grandma had it made by the amazing Pretty Faces shop at Etsy. I highly recommend this store as she was so wonderful to work with and the end result is really lovely. It says "Elliot - 1 year" on the bottom and after a couple of suggested tweaks, the silhouette in a perfect replica of his chubby face, snub nose, and cute curl at the nape of his neck. Oh so sweet and a wonderful moment in his little life to capture his (chock full of character) silhouette. I recently found the plaid fabrics at JoAnnes and my mom was kind enough to sew the pillowcases for me. They add a perfect touch, don't they? And the chunky knit blanket is actually from Target, sure to keep bums nice and cozy through the winter. Hmmm.... it's just so much better. 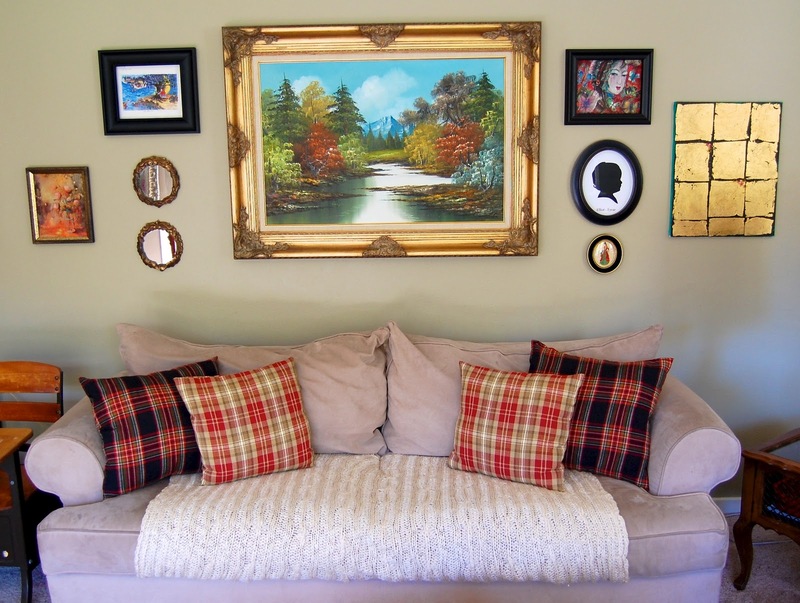 A very inexpensive makeover that had a serious impact on the look of the entire room. I love it when that happens. And look what I found on my doorstep yesterday! How did that happen? Well nevermind how. I'm completely smitten with them and may wear them EVERY SINGLE DAY. So watch out!